During the late 19th and early 20th centuries, the rivers of the United States were home to entire communities of people living in self-made houseboats. The history of these communities has been explored briefly in river memoirs such as Harlan Hubbard’s Shantyboat Journal but hasn’t been thoroughly examined in a present-day context. That is, until a modern shantyboat came bobbing down the Mississippi in the summer of 2014. Wes Modes was at the helm of that vessel. Modes is a lecturer at the University of California Santa Cruz. He is also the primary force behind A Secret History of American River People, a project aimed at capturing “the lost narratives of river people, river communities, and the river itself.” Modes, an artist by trade, has spent the last six years traveling the Mississippi, Hudson, Tennessee, and Sacramento Rivers during the summers, creating a moving museum/work of art, while also documenting the oral history of American river culture and people’s connection to the water. At one time, shantyboats were a common sight along the Mississippi and Ohio Rivers with 50,000 people living on such boats. 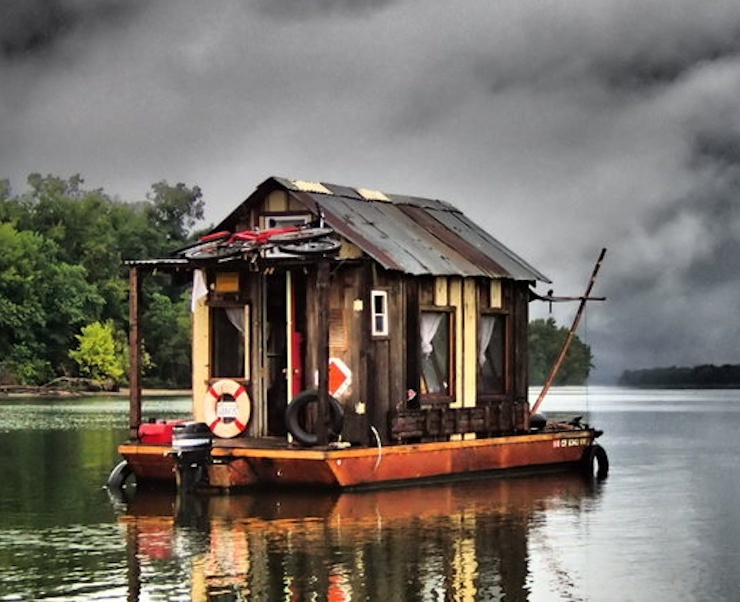 These floating homes were often homemade and crude in nature, fashioned from recycled materials. For around $30 to $40, wealthier individuals could also purchase a houseboat that was less crude, resembling a shotgun house with up to two to three rooms. Modes wanted his shantyboat to replicate those historical models, so in 2012, he began erecting a vessel with salvageable materials. While the hull of the ship was made from new wood, the framing and siding for the cabin were fashioned out of reclaimed lumber from the local dump or from scavenging through sheds and tearing down chicken coops. In 2014, the adventure began, on the river Modes felt loomed the largest in American history and literature: The Big Muddy, the mighty Mississippi River. During that summer, Modes began bobbing down the Mississippi with his shanty-mate Jeremiah Daniels. For the last six years, the two have been riding the currents, along with a rotating cast of volunteers and students from UC Santa Cruz. They have completed 125 interviews with everyone from museum coordinators, artists, marina owners, commercial fishermen, and those that grew up on or near the water. They also have collected hundreds of hours of video footage from their excursions along 1,200 miles of rivers. Those clips live on the project’s website. This summer, the boat will take on another iconic waterway, the Ohio River. The vessel will launch from Pittsburgh, Pennsylvania, in late June and travel through Ohio, West Virginia, and Kentucky. On the other end of the spectrum, if your rich uncle just died and left you a windfall, you might want to check out the new Arkup livable yachts which combine the attributes of yachts, floating houses and waterfront villas, with the added benefits of being self-sufficient, sustainable and environmentally friendly. According to the New Atlas website, “You could be forgiven for thinking that Arkup’s ambitious concept for a floating home would never be realized, but it has indeed been built and is now for sale for a cool US$5.5 million. Boasting solar power, stabilizing hydraulic stilts, and its own engines, the first model was recently unveiled during the Miami Yacht Show. “The Arkup #1, as it’s officially called, is a 75 ft-long two-story ultra-luxury houseboat comprising 4,350 sq ft of floorspace. 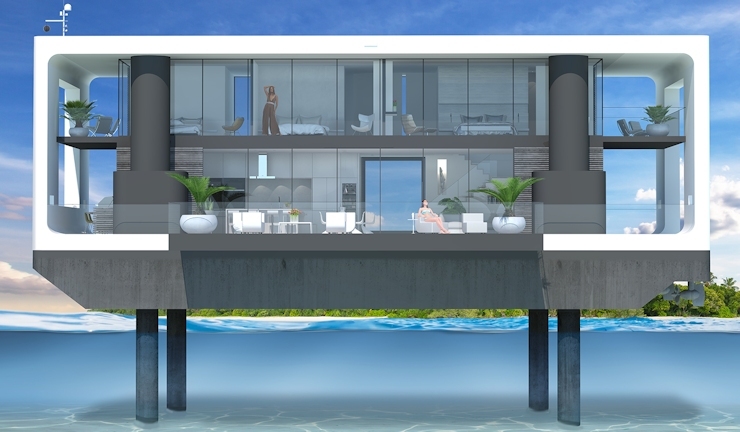 “Its most interesting feature compared to other floating homes we’ve seen is its hydraulic stilts. These can be deployed to a depth of 20 ft (6 m) to stabilize the dwelling or lift it above the water line to avoid waves and reduce hull maintenance. The firm also says that it’s rated to withstand Category 4 Hurricane winds of up to 155 mph (250 km/h). If you’re not quite ready to plunk down $5.5 million just yet, you can charter an Arkup in Miami and cruise through South Florida. More details are available at arkup.com. Previous PostWhat a Load of Crap!